wakefield Archives - Residential Properties LTD.
Like lobster rolls and PawSox games, long lines at the local ice cream stands are a sure sign summer has arrived in Rhode Island. At Residential Properties Ltd., we are invested in the communities we serve, and in honor of National Ice Cream Month, we thought we would compile a list of some of the best scoops in Rhode Island. Ice Cream Machine Co. is the place to be if you’re in the northern Rhode Island area. The stand was started in 1977 by a retired corporate executive with multiple sclerosis. He began selling homemade ice cream out of a one-car garage and quickly gained the attention of locals. Today, the Ice Cream Machine Co. is a Cumberland staple. The stand is located across the street from Diamond Hill State Park and offers massive scoops in more than sixty flavors. Agent Cheryl Davis recommends the Cinnamon in the summer and the Pumpkin flavor in the fall. Those in the Providence area love Three Sisters on the East Side. This Hope St. staple was formerly dubbed “Maximillians”—the new owner changed the name to pay homage to his daughters. The interior has a sophisticated feel, and the store boasts 100 flavors of ice cream, ranging from traditional to exotic. If you plan on indulging a little, you may want to top off your scoop with a little “goop,” a gooey concoction of peanut butter, chocolate and caramel. In addition, the cafe offers frozen yogurt for more health conscious customers. Agent Lenore Leach recommends the Black Raspberry, while Agent Bethany Calitri loves their Strawberry flavor. She is also a fan of their Tropical Tide Smoothie. Those in the East Bay will love the Daily Scoop on County Road in Barrington and Thames Street in Bristol. After sampling high-quality ice cream on boat vacations, the owners decided to open stands in their natural community. 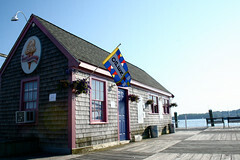 Eight years later, the atmosphere at both locations reflects these nautical beginnings. Their mission is to use only the freshest ingredients and toppings, including fruit, and their waffle cones and ice cream cakes are handmade. Agent Stephanie Nickerson recommends the Coffee ice cream, while Agent Bonnie Koppelman applauds the Coconut Almond. Those in the West Bay flock to Hill-top Creamery on Post Road in East Greenwich. It’s their soft-serve that drives the locals crazy, but the venue also has a variety of unique ice cream creations. If you’re in the mood for a delectable treat try Kay’s Famous Torch, a cone inside a cone concoction topped with an American Flag. But you don’t have to enjoy the scoops alone; the stand features ice cream for dogs, topped with a biscuit, allowing you to share the best of summer with your best friend. Manager of the East Greenwich office, Cheryl Eley, recommends the Baseball Cap Sundae (available in your favorite sports team), which seems sure to charm sports-lovers and taste-buds alike. Brickley’s Homemade Ice Cream and Cakes has only been open for 13 years, but it’s already become an essential part of summer in South County. With two locations, one in Wakefield and the other in Narragansett, this is the perfect place to get a sugar fix on the way home from the beach. The owner doesn’t mess around with fancy flavors, but instead prefers to mix up forty-eight favorites each season using fresh ingredients. These scoops can then be topped with traditional mainstays like “jimmies,” hot fudge and caramel. Agent Judy Chace recommends the Mint Chocolate Chip. Gray’s Ice Cream in Tiverton Four Corners has become synonymous with summer in Rhode Island. The stand has been in business for eighty eight years, and many locals have childhood memories there, waiting in line for a cone. Gray’s ability to remain as a permanent Rhode Island fixture is part of its charm, and just so, the menu has remained unchanged for many years. You can still order classic favorites and feed the remainder to the cows (Oscar and Emmy) in the adjacent paddock. While variations in flavor and texture are exceptional, it’s the simple aesthetic and country atmosphere that make Gray’s such a beloved summertime destination. Grey’s is so good even my daughter insisted on serving their flavors with her wedding cake.